Since we've already established that I'm entering the era of last-minute, hastily prepared dinners, it should follow logically that down-to-the-wire blog posts may happen as well. 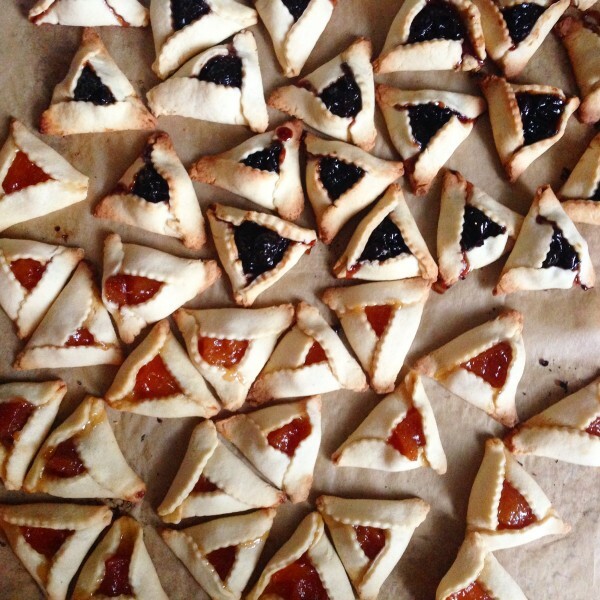 In this case, it occurred to me perhaps a bit too close to Purim that I should share an update to my hamentaschen recipe. At least one of the changes came about due to desperation -- of the "ice storm, not enough butter in the house" variety -- but this year's cookies are the best in recent memory, so even if you've got loads of butter in the house (and lucky you if you do! ), you might want to make them. First change: swap out half the butter for an equal amount (by weight) of cream cheese. I'm pretty sure I've done this before, but it's a winning substitution, as it makes the dough ever so slightly tangy and quite a bit more pliable. Second change: no more splayed-open specimen. I think I've finally mastered getting my 'taschen to stay closed. Two tricks: First, have a little bowl of water handy while shaping the hamentaschen. Dip your finger in the water, and make several circles around the perimeter of each dough circle before filling them (it's easier that way), so that the dough gets moist and a bit sticky. Second, instead of folding the three sides upward, fold them over each other, like flaps. I made 60 'taschen this year, and only 2 flaps opened. Not bad. Other no-big-deal changes I made: I used a food processor instead of a stand mixer, and it worked great. I also reduced the oven temp to 350, because some of my fillings were pretty high in sugar content and I didn't want them to harden in the oven. 350 worked as well as 375 - this dough is flexible. Fillings? This year I went with a theme, called use up the four jars of jam that don't currently have a space in my pantry. Cherry-vanilla, peach-apricot, chocolate-raspberry. All highly delicious. Nice people that we are, we've only eaten a couple six. Make the dough: In the bowl of a food processor, mix butter, cream cheese, and sugar until blended. Add the egg and lemon zest, and mix until combined. Scrape down the bowl. Add the dry ingredients to the butter mixture, and pulse several times, scraping down the bowl if necessary, until dough starts to come together. This is a fast enough dough that you need not worry about creating gluten. Just pulse until the dough forms large clumps; the sound of the processor will change just as dough starts to come together. Gather the dough into plastic wrap or a plastic bag, compress into a solid disk, and refrigerate 30-45 minutes (much longer, and it’ll be tough to work with). Preheat the oven to 350 degrees and line 2 large baking sheets with parchment paper or silpat. Sprinkle a work surface liberally with flour, and roll out the dough to 1/8-inch thick. Use a 2.5-inch cutter to cut disks of dough, and immediately plop the disks onto the lined baking sheet. When the work surface is floured, the disks will pop right out when you pull up the cutter. If not, don’t worry – just use a bench scraper or metal spatula to lift the disks and put them onto the baking sheet. Don’t worry about spacing the disks evenly; these hamentaschen don’t need much breathing room, and folded hamentaschen take up much less space than the disks. This dough has very little liquid, so it lends itself well to re-rolling scraps. I generally work with half the dough at a time, and refrigerate the bunched scraps from one round while I bake the next batch. My oven only fits one of my cookie sheets at a time, but if yours fits multiple, feel free to shape and bake these in fewer batches than I did. Once you’ve got a baking sheet full of disks, prepare your workstation: bring over your filling and two small spoons, and fill a small bowl with water. Put a scant teaspoon of filling into the center of each disk. Use your finger to brush water along the edge of each disk, then fold three “sides” of the circle over each other as flaps (see above photo). Bake cookies for 12-15 minutes, until tops are slightly golden. Remove from the oven and let cool for 10 minutes before transferring. Meanwhile, fill your second sheet with cookies. By the time round 2 is ready to bake, round 1 will be cool enough to transfer, and that baking sheet will be free for batch 3. Among the universal favorites were rugelach, the flaky, jam-filled pastries that are now near-ubiquitous. (Last week, I even stumbled on savory rugelach. Sort of genius.) But at the time, they seemed special. Mostly, they seemed difficult. 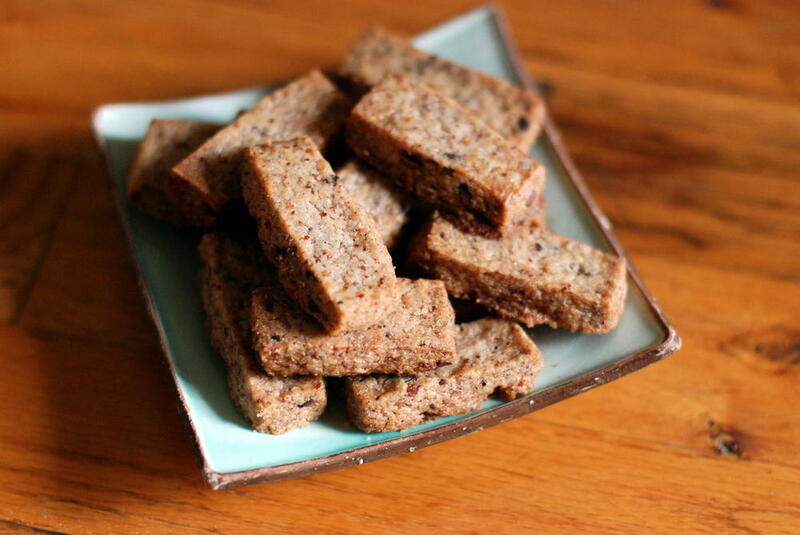 The first time I made them, I understood that while they aren't hard, per se, they are quite fussy. While the dough comes together quickly,it's the bit where you roll the dough into disks and cut it into pie slices. I end up fretting and fussing pretty hard to make sure that each skinny little pie slice you roll up doesn't lose its fillings in the process. Also, most recipes call for apricot jam - why must it always be apricot, which is just about the least likely jam to be in my fridge? The last time I made these, I decided the recipe was overdue for some hacking. So what makes these easier? Two things. First, you can use whatever jam and whatever nuts you have. This is sort of “rugelach without a recipe.” Second, unlike my old favorites, these are rolled and cut much more easily and less fussily. One long strip of dough, filled and rolled into one long log, then cut into pieces on the bias. They're plenty pretty, and more importantly, they're easy. Set a rack in the middle rung of the oven and preheat to 350°F. Line a 13x18 (half-sheet) rimmed baking pan with parchment paper. Whisk together sugar and cinnamon in a small bowl. Assemble the rugelach: Cut dough in half; refrigerate one half while you work with the other. On a floured work surface, roll half the dough into a 12x8-inch rectangle, with a long edge facing you. Spread 1/4 cup jam evenly over dough, leaving a 1-inch border around the perimeter. Sprinkle half the raisins/currants and half the nuts over the jam. Dust with 2 tablespoons cinnamon sugar. I made this recipe on an absolute whim, because my in-laws were coming over for dinner and we had no dessert in the house. My father-in-law, whom I am on record as saying I adore, has very simple tastes in food. He wouldn't have enjoyed the labneh tart I had my eye on. So instead, I figured I'd make straightforward, no-frills brownies. I got home, dropped my shopping bags, pulled up the blog on my iphone, and started at my standard recipe, taking as many shortcuts as possible. One bowl, a fork to mix the batter, a sprayed pan. To make sure the brownies weren't completely flavorless, I added a teaspoon of ground coffee. Not espresso powder; just regular ground coffee. I anticipated a passable version of a loved dessert. Instead -- and maybe none of you will find this surprising -- I made a batch of hassle-free brownies that were actually delicious. As in, my stepmother-in-law asked me for the recipe. I hadn't even written it down, because it seemed like nothing. But I sent her the basic instructions for what I'd done, and then, a couple weeks later, I followed the instructions myself. 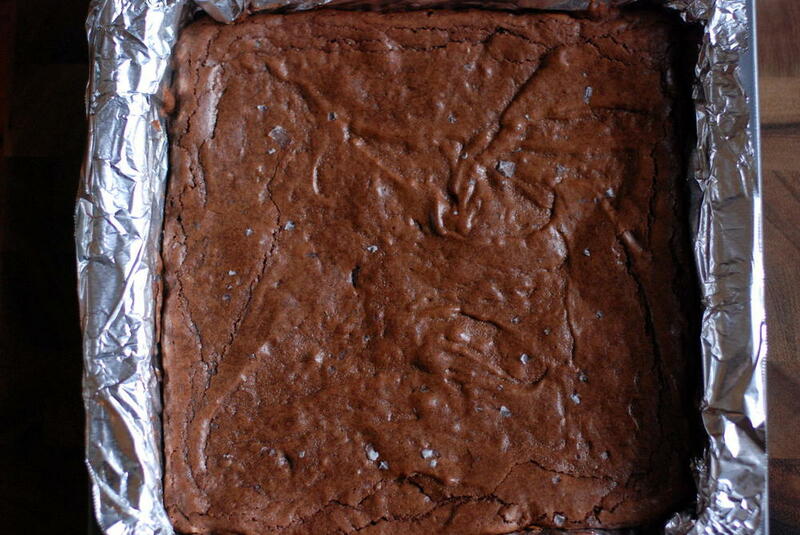 Surprisingly, the grounds melt into the brownies. You don't get grit when you bite in - just a slight undercurrent of coffee that doesn't pronounce itself, but instead intensifies the chocolate flavor. Many occasions call for a quick dessert. Those same occasions call for as few dirty dishes as possible. With that in mind, here are one-bowl, nine-minute brownies. You can make the batter while your oven preheats. Wash the bowl while the brownies bake. I got out the chocolate at 6:05; by 6:14, the brownies were in the oven. By 6:25, the house smelled like chocolate. Victory on multiple fronts. Preheat the oven to 350 degrees F and set a rack in the middle of the oven. 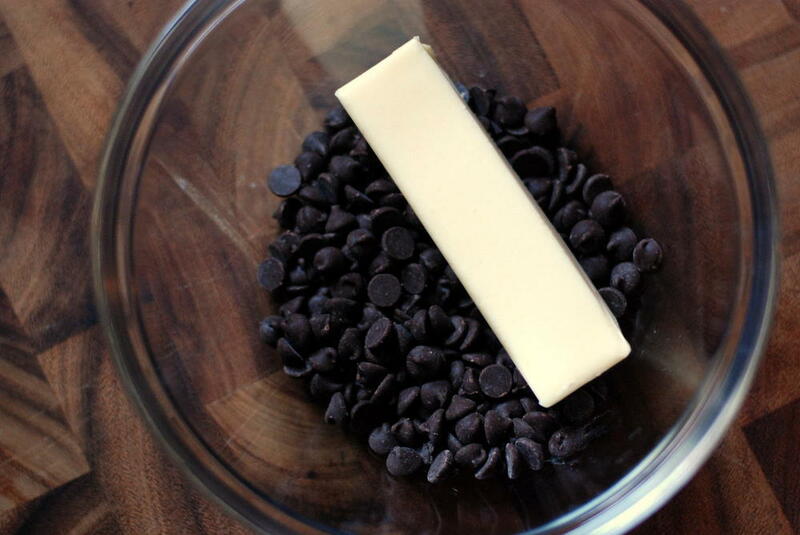 In a double boiler or a large, microwave-safe bowl, melt butter/oil and chocolate chips together, stirring occasionally, until completely melted. This takes less than 2 minutes in a microwave, and about 5 minutes in a double boiler. Remove bowl from the heat and stir mixture until completely smooth. Add sugar; whisk to combine. By now, the mixture should be warm but not hot. Add eggs; whisk thoroughly to combine. Add cocoa, vanilla, and coffee. Stir to fully combine -- slowly at first, so cocoa doesn't fly out of the bowl. Add flour and salt. Stir just until fully combined. If using additional chips, add to batter and stir just to distribute. Line an 8-inch pan with parchment paper or aluminum foil. Grease or spray with non-stick spray. Pour batter into prepared pan, and use your fork or (gasp! another utensil!) a spatula to smooth the top. Sprinkle with a bit of flaky salt. Bake for 25 minutes for fudgier brownies, 30 minutes for firmer brownies, or 27 minutes for something in between. Remove from the oven, and let cool in the pan for at least 15 minutes, preferably 30, before carefully removing the brownies onto a workspace and slicing.